David King: How long will it take before this team, and yourself, will become a finals winning team? Is it a two year process? Is it another 4 years? How long do you expect the Richmond faithful to wait? Damien Hardwick: Listen, I personally think it will be a quick bounce. I think we will be back in finals next year. I’ll be disappointed if we are not in finals next year. Damien Hardwick: Winning finals is obviously the thing we are about. We haven’t been successful thus far. I’ve been disappointed with that part. But the potential I see and the players we’ve got, we get all our personnel on track, we are going to be… I think we are going to be playing finals next year. Most people may have sniggered at the time, but Damien Hardwick was spot-on with his prediction that the Tigers will be playing Finals in 2017. And although he may not have outright committed to winning a Final this year, as it turned out he achieved that too. By winning that Qualifying Final over Geelong two weeks ago, Hardwick achieved a personal milestone whilst ending a 16-year drought for the Richmond Football Club. The Tigers have proven that a lot can change in a single off-season. In the 2017 AFL Prospectus , the Tigers of 2016 were identified as being ranked 15th for time in forward half differential, 16th for forward half stoppages and 16th for turnovers created in their forward half. This most definitely does not fit the profile of the Tigers we have seen in 2017, with their mosquito fleet of small forwards applying manic pressure on the opposition defence - creating turnovers, stoppages and repeat entries into forward 50. Their forward-line is still missing the elite high pressure forwards that were a key component to Hawthorn’s recent premiership glories. But unlike the Tigers, the Giants have not been able to remedy this. The Giants forward line remains characterised as one full of talent, but too often lacking in the defensive side of their game. Physical Pressure Act: Applying direct physical contact to a player in the act of disposing the ball or effecting a tackle that prevents an effective disposal from the ball carrier. Implied Pressure Act: Reducing an opponent’s decision making time without physical contact – via corralling, closing space or chasing from behind. The Tigers and GWS have already met each other twice this year, at Spotless Stadium in Round 9 and at the MCG in Round 18, highlights of which are provided below. Although Richmond lost the Round 9 encounter in heartbreaking fashion, there was a constant theme across the two games – Richmond out-pressured the Giants. Richmond recorded 24 more Pressure Acts in the 3-point loss in Round 9, but then bettered that by recording 66 more Pressure Acts in the 19-point win in Round 18. Given the maxim that pressure ramps up in Finals, at first glance it would appear advantage to the Tigers this week. But it is in the forward line where the pressure plaudits are most being thrown at Richmond. But to justify this praise (and criticism of the Giants), lets look at a comparison of the leading forwards from both the Tigers and the Giants. The leading forwards from both teams were identified as having a goals per game average of greater than 0.8 and having played at least 3 games. This provides us with a list of 7 players for both Richmond and GWS as presented in Table-1 and Table-2. Figure-1 presents each of these 14 players on a single plot for Goals per game versus Pressure Acts per game. Let’s discuss each team in turn. Richmond has one premier goal kicker in Jack Riewoldt, who averages 2.4 goals per game. There is also of course Jacob Townsend, but his average of 4.3 goals per game is inflated from a sample size of 3 games that included thrashings of Fremantle and St Kilda in Rounds 22 and 23. But the trademark of the Richmond forward line is the cluster of players (Martin, Butler, Castagna, Caddy and Rioli) that are all averaging around the goal a game mark, but most significantly are averaging 15+ Pressure Acts per game. This level of pressure is usually the domain of full time midfielders as they move from stoppage to stoppage, so there is most certainly credence in the reputation the Richmond small forwards have established for themselves. Richmond has named an unchanged line-up for the Preliminary Final. Small forward Shai Bolton has been named as an Emergency. He has averaged 15.8 Pressure Acts per game in his 6 AFL games this year and is in strong form in the VFL, so I would imagine he would have provided a strong case for inclusion this week. Most pundits were of the opinion that Castagna was the player most likely in the cross hairs, although I would argue that Townsend’s lack of pressure and return of 3 disposals (albeit for 2 goals) in the Qualifying Final placed him as the most at risk. GWS have an altogether different balance in their forward line. They have three premier goal kickers in Toby Greene, Jeremy Cameron and Jonathan Patton. But of these three, only Greene comes close to matching the Tiger's small forwards for pressure. GWS do have one elite high-pressure small forward in Devon Smith, who averages 21.1 Pressure Acts per game. Although intriguingly he has only been named as an emergency to play this week. And together with the absence of Cameron to a season ending injury, their forward line now looks significantly less threatening. Their direct replacements in the forward line Harrison Himmelberg and Matt de Boer represent significant downgrades. With Richmond naming such a small forward line, I wouldn’t be surprised to see a tall defender come out of the side for Devon Smith before the game to help address their frailties up forward. Figure-2 presents the Goals per game versus Pressure Acts per game for both teams accounting for Himmelberg and de Boer replacing Cameron and Smith. That leaves GWS with Steve Johnson, Rory Lobb and Brett Deledio as their next best forwards, none of whom are known for their pressure (all averaging less than 11 Pressure Acts per game). But what complicates things further is that due to Shane Mumford’s injury, Lobb is now playing in the ruck and then predominately dropping back behind the play, whilst Deledio was switched to half-back last week with some success. This means that GWS will likely be ever more reliant on Steve Johnson to provide goal scoring support up forward, but with his banged-up knee it is questionable how much he will be able to contribute both offensively and defensively. It appears that GWS will therefore be reliant on their resting midfielders up forward (Kelly, Coniglio, Taranto etc.) to not only score goals but to pick up the reigns on applying forward pressure from their less able forwards. In the previous figures there is also the name of one Dustin Martin for Richmond. Although primarily a midfielder now, when allowed to rest up forward he has been a difficult match-up for defenders due to his one-on-one ability. His goal-scoring prowess this season has been a marked increase in his output from 2016 as presented in Figure-3. Despite his great season last year (Richmond Best & Fairest Winner and Third in the Brownlow Medal), it was a career low in terms of goals output. In 2017, not only is he scoring more goals, he is also creating more goals, with his score involvements up 44% from last season. With Martin both supplying and kicking goals, Riewoldt playing the key forward role that is always creating contests and a band of a high-pressure small forwards that are also contributing to the scoreboard, the Tigers appear to have found a forward line system that may very well carry them through to their first Grand Final in 35 years. This group really looks forward to playing in front of a huge crowd. We’ve got a lot of boys here who are built for the MCG. But I don’t buy it. He is clearly trying to build some confidence into his own players as their record of 1 win in 11 games at the MCG is poor whichever way you look at it. But it is GWS’s record against good teams away from home that is even more alarming. Over 2016-17 they have played interstate against Top-8 opposition on 8 occasions (a surprisingly low number) for 2 wins. But those 2 wins were against the 8th placed North Melbourne in Round 23 last year after they fell off a cliff in the second half of the season and the West Coast Eagles this year who were lucky to sneak into the Top-8. These Giants need to do some more convincing before I back them again in a big interstate game, particularly during Finals. The biggest crowd the Giants have played in front of was 60,222 against Sydney on neutral territory at Stadium Australia during the 2016 Finals series. Their highest attendance in an interstate game was against the Crows two weeks ago at Adelaide Oval in front of 52,805. It is safe to say that they didn’t handle that occasion too well. So how are they going to handle 90,000+ screaming Tigers fans this weekend? The noise will be electric, the Tigers will out-pressure them, the Giants will be shell-shocked early and the Tigers will go on and win. I’m on the Tiger bandwagon this week and I’m looking forward to enjoying the ride. All of Richmond's leading forwards hit the scoreboard and all were in double figures for Pressure Acts. Even Jacob Townsend, the player for whom I queried his role in the team managed to register 21 Pressure Acts - his spot is safe now. Whilst for GWS only Himmelberg and Patton contributed to the scoreboard and only Matt de Boer with 22 pressure Acts was able to apply significant amount of pressure on the Richmond defenders. 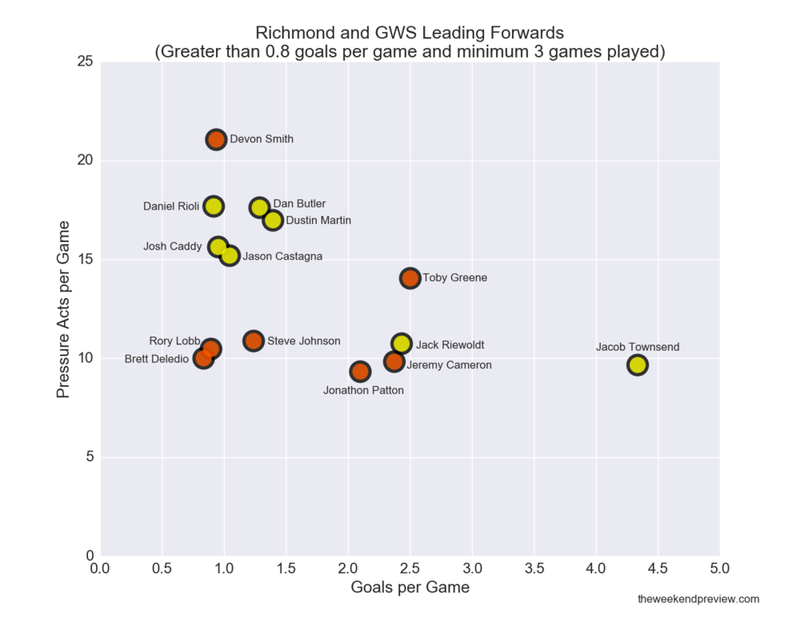 Based on the forward lines alone, Richmond were deserved winners. Now we turn our attention to the Grand Final where Richmond will face Adelaide. Figure-6 below presents the Goals per game versus Pressure Acts per game for all of the Richmond and Adelaide forwards that will be playing in the Grand Final and average greater than a goal per game. Adelaide unsurprisingly have a greater spread in goal scoring power than Richmond, led by Taylor Walker, Eddie Betts and Josh Jenkins. And although the pressure the Adelaide forwards apply is a step up on what GWS could muster, Richmond still have the edge in the ability to apply pressure to the opposition defenders. An intriguing Grand Final awaits. “GWS Giants ‘built for MCG’, says Brett Deledio”, Andrew Wu, The Age, 19th September 2017.